2013 Cyber Monday will be big. Our economy is doing a bit better, the Black Friday crowds a deterrent, and a bigger mobile adoption. 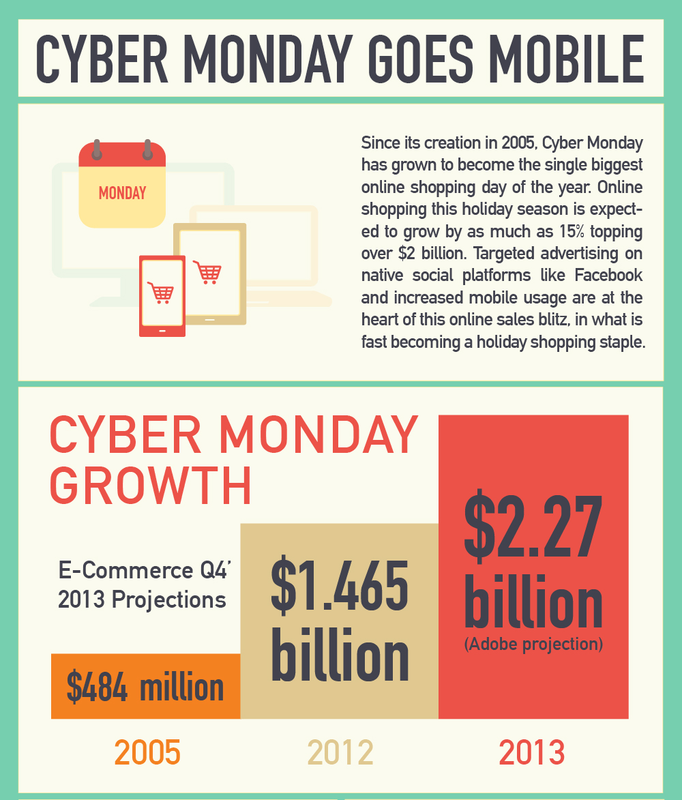 Our friends at Ampush has released an infographic(below) showing the Cyber Monday momentum. Also, Forbes mentioned recently that "more people will visit Cyber Monday online than visit Brick and Mortars on Black Friday." Attention Brick and Mortars: Do you think you need an on-line presence now? Still, in terms of revenue, Black Friday still is the king and online security concerns keep some e-shoppers at bay. In the Forbes article above, they outline some safeguards for Cyber Monday shopping and Zippycart has a great article for e-tailers on security. Check out the Cyber Monday stats below. Smartphone owners love coupons: "47% of consumers want coupons sent to their when they are in-store or nearby"
Social commerce continues its momentum: "1 of 3 facebook users have purchased a product after sharing, liking or commenting on it"
Consumers avoiding the Black Friday lines: "44% more likely shop if they buy online and pick-up in-store"
Also, check out a related article on Social Commerce, "Get Rewarded for Being Social with Your Purchases This Season"